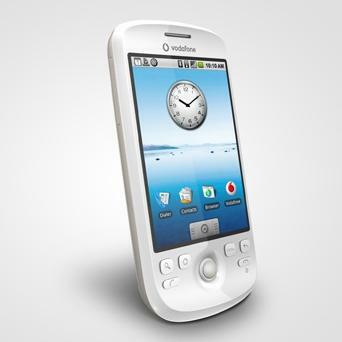 The new smartphone will soon battle its predecessor, the T-Mobile G1 (also called the HTC Dream) in Europe. Vodafone plans to launch the HTC Magic in the U.K., Spain, Germany, France and Italy and several other Vodafone markets over the next few months, the company said in a statement. T-Mobile has said it would roll out the G1 in continental Europe in the first quarter of this year. Vodafone did not provide pricing information, nor nail down a specific launch date. HTC isn't the first company to show off an Android phone at the Mobile World Congress in Barcelona so far this week. Chinese handset maker Huawei revealed its first Android-based smartphone on Monday. The device, which resembles an iPhone, will be available in the third quarter of this year. The HTC Magic will launch much sooner than Huawei's device. HTC has a jump on most other smartphone developers when it comes to Android because the company worked closely with Google to make the first smartphone based on the new OS and software, the G1. The new Android smartphone shares several similarities with the G1, judging by the specifications. The two handsets sport 3.2-inch touchscreens with 320x480 resolution. They both have 3.2-megapixel digital cameras and both handle many of the same wireless technologies, including Wi-Fi, GPS (Global Positioning System) and 3G (third-generation) signals via WCDMA (Wideband CDMA) as well as high speed data via HSPA (High Speed Packet Access). The also both use track balls and enter buttons as means of navigation. The HTC Magic differs mainly in its sleeker design and lack of a QWERTY keypad. The device is smaller and lighter than the G1 despite the same size screen, at 113 millimeters by 55mm, compared to the G1's 117.7mm by 55.7mm. The HTC Magic is thinner at 13.65mm versus 17.1mm thick for the G1, likely due to the lack of the keypad. The Magic is also lighter at 118.5 grams (4.18 ounces) with the battery, compared to 158 grams (5.6 ounces) for the G1. The HTC Magic will be available in white in the U.K., Spain and France, black in Germany and both colors in Italy, Vodafone said.